Much time, effort and resources go into making a bed quilt of any size, but especially a big bed quilt for a queen or king size bed. You've carefully selected fabrics and a patchwork style. Have you given batting the same thoughtful consideration? Your batting choice will make a huge impact on how your quilts feels and washes. Batting can make a quilt feel puffy or flat, heavy or light, warm or just barely-there. What kind of quilt do you want? Here are some general batting categories and how they'll effect your quilt. Take the time to choose the best quilt batting for your bed quilt. This is the batting style most popular with modern quilters. 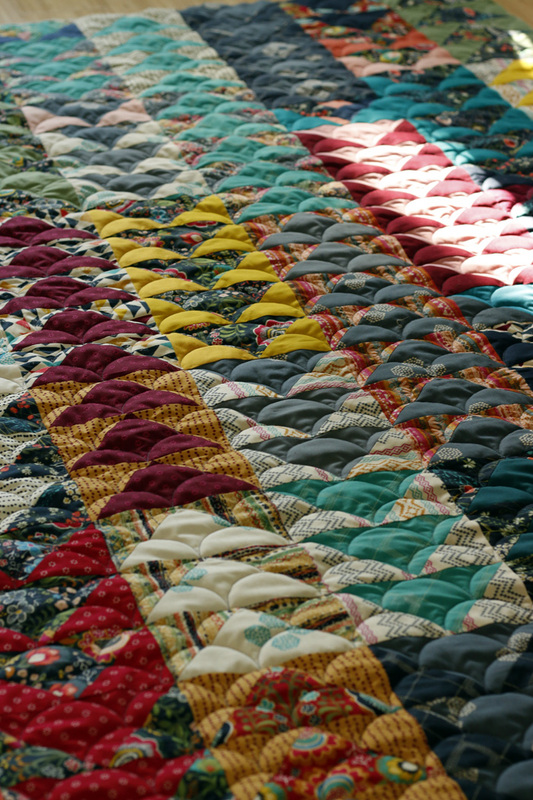 It's also most similar to vintage quilts because, being cotton, it shrinks and causes the quilt to crinkle. Expect shrinkage of about 3%. Low loft cotton is a thin batting which doesn't provide much warmth. It's nice for a light covering, all-weather quilt. You'll need to use with several blankets to stay warm in the winter! Want to minimize shrinkage? Some quilters prefer an 80/20 Cotton/Poly blend over 100% cotton because this type of batting will have low to zero shrinkage. When making a bed quilt size really matters! If you didn't factor in shrinkage to your bed size, 80/20 batting may be the solution. Due to the polyester content, this type of batting is slightly warmer than 100% cotton batting. It's just as low loft and easy care. The touch of polyester also reduces wrinkles in the finished quilt. If you'd like a warmer quilt, look beyond low loft battings. Loft automatically builds warmth by trapping heat. Even if you stick with cotton, your quilt will be significantly warmer. Mid loft cotton battings are also heavier and may be subject to increased shrinkage. My husband prefers weightier bedding. He recently made a wholecloth blanket for our bed, to be used under our main low loft quilt. 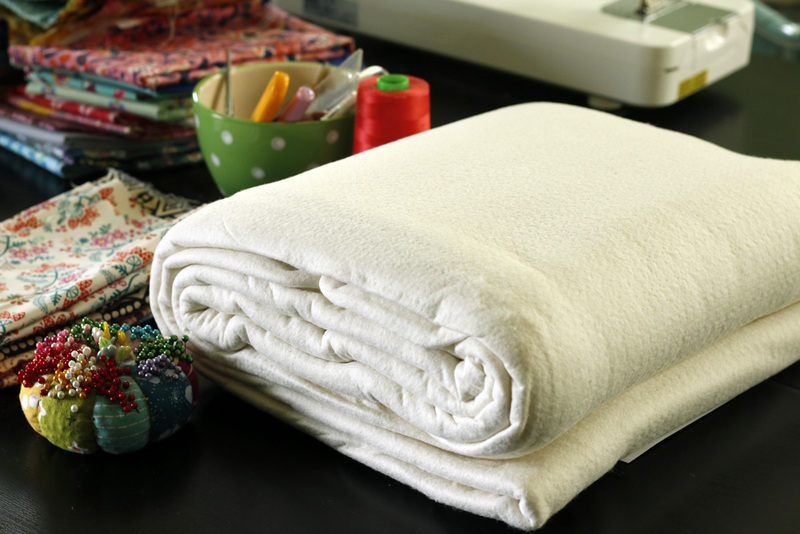 He used Quilter's Dream Cotton Supreme, which is twice as heavy as the same size batting in the Cotton Select weight. I measured the blanket after quilting (102" x 109.5") and then again after machine washing and drying (91" x 105"). It shrank by 9" in one direction and 4.5" in the other. That's shrinkage of 4-9%. Important to keep in mind! We're very happy with our new blanket, though. We have had a couple low loft quilts on our bed that just don't provide enough warmth in the winter. With this more substantial quilt, we're finally feeling cozy! To really crank up the warmth, look to a lofty batting such as polyester or wool. Both fibers are much lighter than cotton, so they provide insulation without adding weight. Lofty battings also provide more stitch definition, causing quilting to really pop. Here's an example of a wool batted quilt, we recently quilted in our longarm studio. Polyester is an affordable fiber that can be easily machine washed and dried. 100% polyester battings will experience minimal to zero shrinkage. They are very wrinkle-resistant. Wool batting is more expensive, but more breathable. Ultimately, it makes a more comfortable year-round quilt than polyester. However, most wool battings cannot be machine dried warm. Read care instructions carefully. Plan to air dry your wool batted quilt. Examples: Dream Puff by Quilter's Dream and Dream Wool by Quilters Dream. If your quilt has mostly dark hues, use a black batting for rich color. Conversely, if your quilt has lots of white, a bleached white batting will brighten the quilt. These colors are generally available only in low loft battings, either cotton or poly. Examples: Warm & White by The Warm Company and Dream Black by Quilter's Dream. At Stitched in Color Quilting Services we provide a low loft cotton batting as part of our service. We're happy to upgrade you to the Quilter's Dream batting of your choice for a modest fee. We chose to stock Quilter's Dream because they have so many batting options. Please use the right batting for your particular goals. You'll be SO glad you did!